10 + 6 = ? : (Required) Please type in the correct answer to the math question. The Fort Loudon lock is used so little that it doesn't open until 9:00AM. The marina is right at the lock so we waited until close to 9:00 and were at the lock at 9:00AM. The lockmaster said we would have to wait 20 minutes before he could open the lock. We were the only boat through and were out by 9:40. I thought we would have a lot of current to speed our way, but it seems that on Sunday morning they don't need to generate a much power so there was hardly any current and we cruised at 9.2 mph. A current of only 0.2 mph. It was a beautiful sunny day. 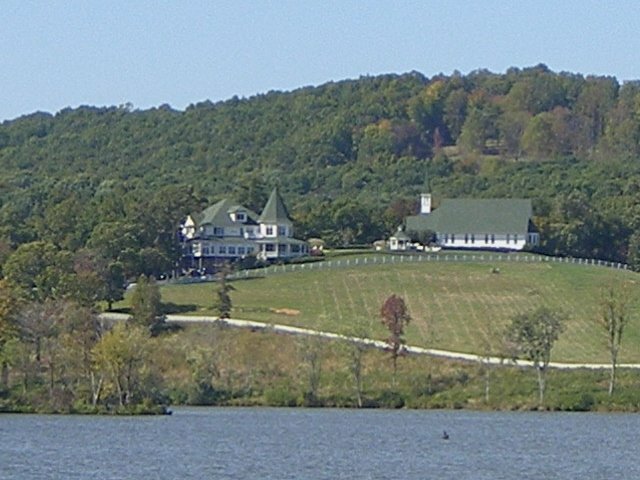 The photo is of a place on the chart called Tennessee Chapel. It seems to consist of two large homes, a barn, and a church. There were horses like Clydesdales in the field. I will have to do some research. It is in a beautiful spot overlooking a long reach on Watts Bar Lake. We arrived at Blue Springs at 3:00PM. When calculating the time it will take using the miles marked on the chart it is confusing as there is a cut-off or short cut that saves 5 miles on this leg. Consquently we arrived much earlier than I had planned on as we took the short cut. We were greeted on the dock by Phoebe and Bob on Flamingo, a 62 ft Hatteras. Live-aboards, they have been here all summer to escape the hurricane season in Florida. Phoebe has family near here so it was very convenient. While this is a large marina it does not seem to be very friendly, so they seemed glad to have some company. In two weeks they will head down the Tenn-Tom to the Bahamas for the winter.